The 42nd KLDMC Annual Classic Car Rally will take place on Sunday 30th June 2019 in aid of NARS. We are delighted to have continued sponsorship from ACA plus additional support from Bennett & Co., Steve Cato, Bearts of Stowbridge & Hylton Gott. We will be visiting the Thursford Collection and Pensthorpe Nature Park. Further details and entry forms are now available here. Or to receive a copy, please email us or call Adrian Cunnington on 01406 364795. Our 41st Annual Classic Car Rally ran on Sunday 8 July 2018. We had a great day with some superb weather. 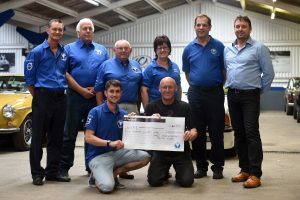 This year’s rally was able to raise £500 in aid of the Norfolk Accident Rescue Service. We are grateful that the event was sponsored again by Anglia Car Auctions of King’s Lynn. Thanks for additional support from Hylton Gott and Witham Oils. Previous PostKings Lynn & District Motor Club needs your (or your kids!) help!